Fraser has had pretty much instant success when he stepped up to the Ironman distance, winning his debut Ironman in 2010. He made it to Kona that year, finishing 29th: “I spent a full month on the island leading into the race, which I feel was too long. I became stale and probably a little drained by the conditions on the island.” The following seasons were not quite what he was hoping for, it wasn’t before this season that he was able to make another serious attempt to race at the Ironman distance and to qualify for Kona. 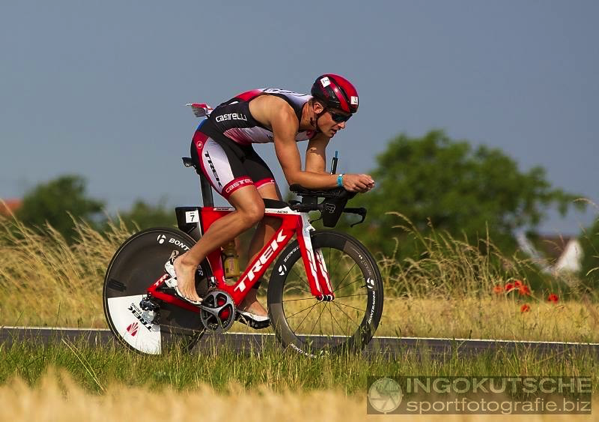 It started well with a second place at IM Wales after a good battle with Matt Trainman. He raced IM South Africa but struggled a bit with a 19th place finish, and a 13th at 70.3 Pays d’Aix didn’t add too many points. He was getting into form for the summer (6th at 70.3 Kraichgau in a strong field) and finished second at his “home” IM in Bolton. “Without doubt my season highlight. It was my goal race for ’15 and given I led the race for quite some time on the marathon it was a fun day. My mate David McNamee had a superb day and if I wasn’t going to win, I was glad he did that day.” Still that left him 125 points behind Luke Bell who received the last July slot. While he was hoping to avoid having to do another full distance Ironman, he still wanted to make it to Kona: “It was a case of wanting to be back on the island to race rather than spectate as I have done the last 3 trips. The atmosphere is quite simply unlike any other race out there. Also, I genuinely believe it is the only race that truly matters. It is generally what people will ask me about and it is also important from a sponsor perspective, in my opinion.” His first try to add points was 70.3 Dublin, but a flat left him far behind, finishing in 11th place for only adding 85 points. He was very much troubled by the uncertainty, so rather that follow the racing and see others race him out of the slots, he decided to travel to Indonesia and race the P-750 70.3 there. In the end, his 7th place there wasn’t really needed for a Kona slot, so a lot of worries were unnecessary after all.